To visit Craig on Fandalism, CLICK HERE! To visit Craig on Bandmix, CLICK HERE! Guitarist Craig “Mr. 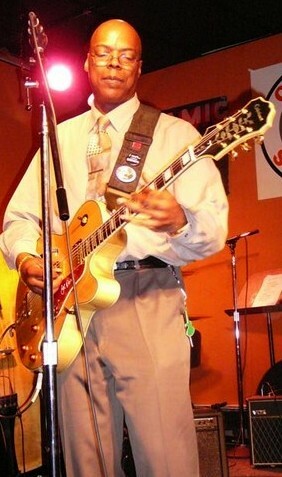 Rhythm" Mitchell, a Newark native specializing in "the lost art" of rhythm guitar, has had a diverse musical career. T-Bone Walker, Wah Wah Watson, B.B. King and Nile Rodgers, among others, Craig first picked up the instrument during his teenage years. He later decided to pursue a career in music, and has been playing professionally in the metropolitan New York area since the mid ‘90’s. With his low key personality, Craig lets his music do his talking, and what a wonderful conversation that is! Filled with arpeggios, riffs, and syncopated accents, Craig’s free flowing style will have you moving to the beat. His repertoire includes playing jazz standards, classic rock, lounge, smooth jazz, blues, and the R&B classics, as well as improvisation and background vocals. Craig is currently passing his musical knowledge on to future generations at the DeBellis School of Music in Newark, where he teaches guitar, drums, and music theory. He also volunteers several days a week at the University of Medicine and Dentistry of New Jersey (UMDNJ) in Newark, and is the Music Director of its African-American Heritage Committee. Additionally, Craig plays for the Gravel Hill Missionary Baptist Church in Newark, where he is also a member.